The Lucid key has four panels. Each feature in the Features Available panel is listed above two or more of its states (also referred to as feature states). For example, "simple" and "complex" are two states of the feature "Maxillary palps." Each state is shown alongside or under a state illustration or icon. 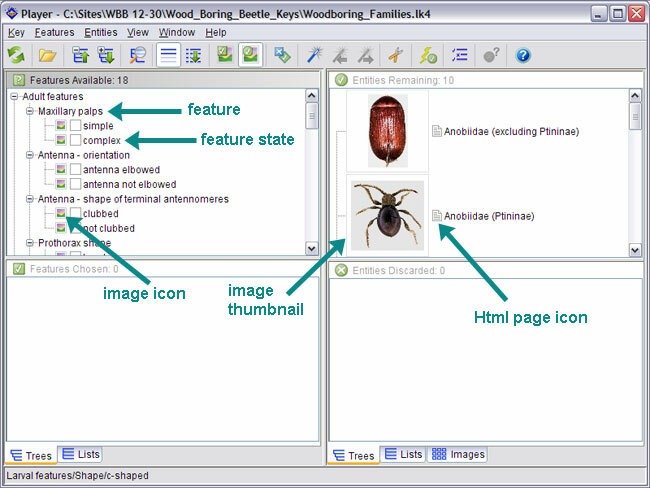 State illustrations are indicated by icons or thumbnails, depending on the display options you choose. Each taxon in Entities Remaining is linked to an Html fact sheet page containing informational text and images. This page is indicated by a small grey icon. 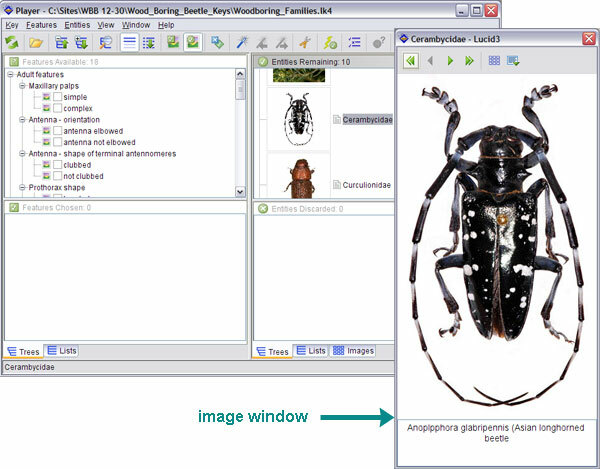 Each taxon is, in addition, linked directly to images. These are the same images as those shown on the fact sheets. Taxon images are indicated by icons or thumbnails, depending on the display options you choose. NOTE: web pages such as fact sheets attached to items in Lucid interactive keys may be considered pop-ups by certain browsers (such as Internet Explorer [IE]) when clicked on by users. If your browser blocks these pop-ups, in your browser's Internet settings you should allow pop-ups for this Lucid tool. Clicking on an image thumbnail or icon opens an image window. This image window provides access to all images linked to that taxon or state. Features are grouped into two Subsets—Adults and Larvae, that enable you to view only adult or only larval features. If, for example, your specimens are only adults, you might choose the Adults subset. This can be particularly useful when using the Best tool, so that Best chooses only applicable features. View available subsets by clicking on the Subset button on the toolbar. Most technical terms used in this tool are defined in the glossary; however, users may want to familiarize themselves with general positional terms such as: anterior, posterior, ventral, etc. These terms will help the user more fluently navigate the identification of their specimen. One tool that may aid the user in more efficiently using this identification tool is a dissection microscope or high-powered hand lens. For some features, such as mouthparts, high magnification may be required to adequately visualize the morphological feature. Review Best Practices for further, comprehensive recommendations about how best to use Lucid interactive keys. Also consult Lucid Player Help for comprehensive information about how to use the interface and all Player functions. Drawings and photos used to illustrate feature states are or are adapted from, for the most part, illustrations of particular species, or are diagrammatic. They are intended to represent a range in appearance and are meant to be used as examples. In choosing a state, your specimen need not exactly match the state's illustration. Rather, choose the state to which your specimen looks the most similar, and/or pick the state that, by its wording, best describes your specimen. Taxon images were chosen based on one or more of the following criteria: A species depicted in an image may: 1) demonstrate an important morphological variant or be at the far range of variation given; 2) represent a well-known pest that may be intercepted at a port of entry; 3) be the only, or one of a few, wood boring taxa within that particular family of beetle; or 4) have been readily available for imaging. Please note that the images provided do not necessarily reflect all known morphological variation within the chosen family, nor is the illustrated species indicative of all wood boring taxa within that family. In general, taxon images showing a specimen oriented vertically are dorsal views, while those oriented horizontally are lateral views. Captions specify the view if otherwise and/or if the orientation or view is difficult to discern. Captions on images of larvae linked to key taxa indicate they are larvae, while adult image captions do not specify they are adults. Common name. The common name(s) listed within each fact sheet are the more widely used English-based common names for that family or the wood boring members of that family. These names may or may not reflect the Entomological Society of America’s designated list of official common names, but rather are solely those known to be in common usage. General distribution. The general distribution given represents the geographical area where members of the family are known to occur. A cosmopolitan distribution is indicative of a taxon that occurs on all major land masses, islands and archipelagos. Component taxa. The numbers provided in this section are derived from multiple sources and are estimates of the total diversity of that family. Description. The adult and larval descriptions provided are based on multiple literature sources, personal observations, as well as communication with colleagues and specialists and are indicative for all taxa of the given family. The descriptions are designed to provide the user with general traits that are applicable for the entire family and may or may not reflect all morphological variation within the family. Pest information. The pest information provided is intended as a general treatment of representative pests within the family and does not constitute a complete listing of species nor the type of damage the exemplar pest may induce. These treatments are solely intended to provide the user with some of the more well-known and/or destructive pest taxa of the family. Should you wish to print a fact sheet, it may not print out correctly from Internet Explorer. At this time, it is recommended that you print out fact sheets in another browser.